Roast beef hadn't been on the menu in quite a while when I spied a beautiful grass-fed, antibiotic-free sirloin roast at the meat counter of my local natural foods store. It weighed just 2.375 pounds (a little over a kilo) and was somewhere between 2 and 3 inches thick. I couldn't recall ever cooking a roast that small and thought it would be awfully easy to overcook it. At $25, this was a splurge I did not want to ruin! Cooking a large roast is "easier" in that it is a lot more forgiving than a small one. A small roast can go from perfect to ruined very quickly. Since there are so many variables when cooking a roast, merely going by time, so many minutes per pound, doesn't really cut it. Though, of course, figuring an approximate time is important if you want to make sure the whole meal is ready at the same time! This time I chose to check the temperature manually from time to time, using my Thermapen, because that's what I'm used to. But I do own the other kind with a probe you insert into the roast and wait for the alarm to go off when the desired internal temperature is reached. Next time I'm going to remember to try it! I let even a small roast rest for 30 minutes while I make gravy and bake the Yorkshire Pudding. Even if you don't do those things, let the roast rest 20 to 30 minutes anyway. I've often read that a roast will rise in temperature by 10 degrees Fahrenheit while resting, but I've not found that to be the case. It will rise about 5F/3C, so to avoid overcooking, take it out of the oven when it reaches 5F/3C under your desired final temperature. See the chart below. Even though I no longer prefer well-done beef, I do like a nice crusty exterior. So I start the roast in oven preheated to 450F/230C/Gas8. After 10 minutes, I reduce the heat to 325F/165C/Gas3. I took this roast's temperature after 55 minutes at the lower heat, looking for 145F/63C for medium-well. Checked it every 5 minutes after that, and after a couple of times it had hit my target temp. Do you ever cook a small roast? I was surprised that this actually made 8 good servings as there was zero waste. Also, I'm always curious about the degree of doneness that people prefer. 1 Rub the roast with a little extra virgin olive oil (I used 1/2 tablespoon for small roast) and season all sides with salt and coarsely ground black pepper (I used 3/4 teaspoon of each for the 2.375-pound roast). 2 Place the seasoned roast fat side up on a rack set inside a shallow roasting pan. A quarter sheet pan works well for a small roast. 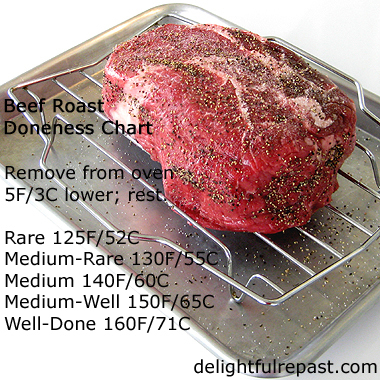 Let stand at room temperature for 1 hour before roasting. 3 Fifteen minutes before end of that hour, preheat oven to 450F/230C/Gas8. If you are using a probe-alarm thermometer, such as my ThermoWorks ChefAlarm or DOT, insert it into roast; the alarm will go off when it reaches the temperature you've selected. 4 Roast at the high temperature for 15 minutes. Reduce heat to 325F/165C/Gas 3. Continue roasting until beef registers 5F/3C below your desired final temperature on instant-read thermometer, such as Thermapen or ThermoPop. 5 Let stand at room temperature, tented with foil, for 20 to 30 minutes. Serve with Yorkshire Pudding, Mashed Potatoes, Gravy and vegetables. And take a peek at Braised Brisket while you're at it! Disclosure: Some posts contain links to my affiliate account at Amazon or ThermoWorks. If you purchase something through one of my links, I receive a small commission, at no additional cost to you, which I use toward the expenses of running this blog. Thank you! Makes me want to go cook one right now! Thanks, Sylvia! I'll be making one again real soon. This is such great information, Jean! I needed it. I love a crusty exterior and a perfect interior, and almost never get it with a small roast, which is what I'm making more these days. Thanks for this. I'm going to print it out and put it in my folder. Judy, I'm glad it was helpful. Nothing worse than ruining a good roast. Thanks, Jean. I get a little edgy making meat of almost any time with the cooking times so this is really helpful. I, too, like a crusty exterior and medium rare interior. Always helpful and fun coming here. Thank you so much, Jeanie, for your kind words! There's some wonderful advice in this post, Jean, and the tips are really helpful. Cooking smaller roasts really can be very different! Shared on the Hearth and Soul Facebook page and scheduled to pin. Thank you for your support of Hearth and Sou! April, thank you. AND thank you for sharing on your social media - much appreciated! Very interesting. We always sear the meet in a skillet before baking. Why? My mom did it. ~grin~ We always ate it well done. I didn't know you could eat roast any other way. This has opened my eyes! Hi Jean, So glad you found the courage to cut your husband's hair. It's a major money saver! Thank you, Laura. Yes, you can do that initial sear in a skillet on the stove, but I don't like dirtying up any more pots and pans than I have to! :D Another reason to roast to a less well done stage is that it reduces shrinkage, so you might say it's the frugal thing to do! One of my all time favorite meals is a good roast beef with mashed potatoes, peas & pearl onions, and gravy. Oh my gosh, you are making my tummy growl with this!! MM, yes, you gotta have the gravy! And the peas and pearl onions. And mashed potatoes? Just my all-time favorite food! Ka-ching! Ka-ching! Ka-ching!...just counting the $$ I saved at $25 a toss by not eating roast beef (roast beast, according to my chilluns). Yes, I’m a carnivore, but I’m in elitist carnivore. Think prime rib with horseradish cream sauce. There is one good thing about roast beef, especially if one wears out shoes quickly. Very little tanning required to convert to shoe leather. All that said, I’m quite willing to believe that with a little “Jeani” magic everything I’ve written is NA. Somewhere between dry-crumbly and sinewy you probably work another miracle. Thank you for your vote of confidence, Sully. Yes, I've worked another miracle - it's called using a thermometer to make sure I don't overcook it! And thanks for reminding me of horseradish cream sauce; I haven't made that in years. I haven't made a roast in ages because of the price and the fear of ruining it - but now maybe I'll take a chance if I ever find an organic roast on sale. I occasionally find organic chicken on sale, and I stock up and freeze several packages, but I'll keep my eyes open for a roast now. Thanks for the detailed info! Quinn, I'll be keeping my eyes open for organic roasts on sale, too. I like to have a well-stocked freezer. Let me know when you cook one! I cooked just such a small roast on Sunday, and did it nearly identically. I use a regular old-fashioned probe and it worked well, but I love the idea of that pen. I meant to make the little Yorkies, but life intervened. I missed them with the gravy!.....but they are on my agenda for next Sunday. Yum, Sunday night's dinner that I grew up with. I continued the tradition for many years but now we don't eat much red meat. It's a treat at times and always yorkshire pudding! Pondside, must be true what they say, 'Great minds think alike.' :-) My husband didn't grow up with Yorkshire pudding, but I think he's addicted to it now! Judith, I don't think I'd enjoy it nearly so much if I had it every single Sunday anyway; so maybe it's just as well we've cut back on meat for our health. I don't avoid red meat, really, I just eat smaller amounts than some people might. We eat less and less meat these days, but a good roast is always welcome! Save this for a special occasion, Jean. Thanks! First you gave us Yorkshire Puddings and now roast beef!! Oh Jean, you are real temptress!!! I must admit you made me smile, "a beautiful grass-fed, antibiotic-free sirloin." Usually, we make a roast at Christmas -- very large and aged. If we want a cut of meat we make a delicious London Broil or grill sirloin steak. In the US, it sounds like our meat is less expensive. And we do like our meat medium rare to rare. We don't eat a lot of meat -- we eat more fish and chicken. Your roast looks delicious!! Have a great weekend. Thank you, Cheryl. Of course, with your family, you probably do large roasts. Angie, thank you. I've never been a big meat eater, but I like to source it carefully and eat small portions. Tony, I'm afraid I can't think of that bullock "coming soon to a dinner plate near me." I must pretend the meat I eat is a vegetable! :-) I'm glad Britain's food industry has high standards, and I hope that will continue. Marisa, we don't eat a lot of fish, more chicken, turkey and pork. When we have beef, it's more often steak or London broil, as you mentioned, than roast; but that might be changing now that I have the small roast down pat. I like a good roast with potatoes, carrots, onions, and celery :) Thanks Jean from Grammy Dee, #WednesdayAIM #LinkUp #BlogParty, social media shared. Thanks, Grammy Dee! Social media shares are always greatly appreciated. And I like that kind of roast too. I am now craving a simple roast beef! The simplicity of a salt and pepper crust is one of the best things in life! 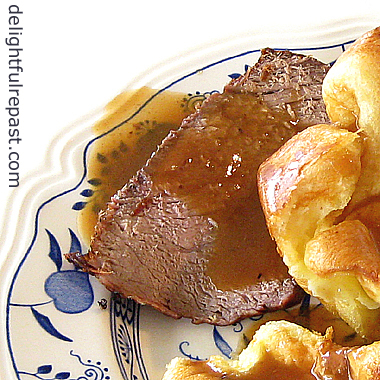 I haven't had roast beef in a while...now I'm craving one with Yorkshire pudding! Have a good weekend, Jean! Thanks, Margie. And, yes, *you* must have it with the Yorkshire pudding! Great post, Jean! So many of us need to know the basics of the basics! And others, like my daughters (! ), need to know everything! I picked up some great tips here and I also scrolled down to read how you make your Yorkshire pudding. I'll try the mustard. I use buttermilk instead of milk, that might be something you'd like to try down the road. Jane, thank you! And I'll definitely try the buttermilk (on a day when I'm not feeling so "traditional" that I *must* use the same ingredients as my English grandmother!). Thanks for this recipe. I will try the higher temperature to start with and see if I can get mine crusty. I'm so glad you like it, Sugar! And I do larger roasts at the higher temperature for a bit longer. Ruth, thank you so much! It makes me happy to think of my braised brisket as a family favorite of yours! Yorkshire pudding would go beautifully with that as well. Thanks, Menaka. And, of course, it's organic! Bridget, thank you! It's a wonderful thing to make for two! We love Roast Beef and your recipe looks delicious! We always love your recipes at Full Plate Thursday, thanks so much for sharing them with us! Hi, Roast is one of my favorite meals. I remember when I was 12 and had my tonsils out...as soon as I could eat again, roast with mashed potatoes is what I requested from my mom! This is one dish that I'm always afraid to tackle but you make it look very doable :-) Thanks for the recipe. Mildred, that is a sweet food memory! Reminded me of being home from school sick when I was in high school and my mom made me a cold roast beef sandwich. So good! And, of course, mashed potatoes are my favorite food in the whole world. Thank you, Amalia! That's just what I try to do, give enough details about something so that someone who hasn't made it can do it. Thank you for this great recipe. I love roast and I am always looking for a great new recipe. This looks delicious! Thank you, Erin! I can't afford a big roast :D and small roasts can be tricky, but I think I have it figured out! Thank you, thank you. My husband and I were just discussing the best way to cook a roast and get it to the right temperature without overcooking. We are definitely going to try this. Christie, I'm so glad. I just love it when one of my posts fills a need for someone. 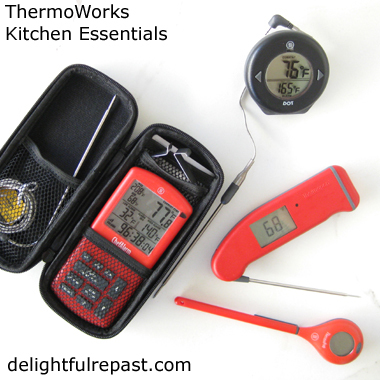 Once you get used to using a thermometer, you'll never go back! Takes all the guesswork out of it. Jan you have taken me back to my childhood. My mom used to make roast beef every Sunday, And it would always come out perfect. Soft and juicy on the inside. After she passed I never had it again and of course I never tried to make it because I was sure I wouldn't be able to replicate my mom's cooking. Well now you have inspired me to try it. So I'll be pinning and hopefully in the near future I will give it a try. Oh Mary, thank you. I feel privileged to be the one to inspire you to try to carry on your mom's food tradition. Do let me know how it turns out for you. Being a dump and pour cook, I do most things by feel and rarely by a measured following of the recipe. I never think about how much salt and pepper to put on the roast...I just know from years of cooking in the kitchen with my mother. One thing I haven't done is to let the roast sit out an hour prior to cooking. I think I will give that a try...and to let it sit a full 30 minutes after. There is always something I pick up from you, Jean, that I'm willing to try. Thanks! Thanks so much, Sue! Yes, I make most things "by feel" as well, but it's no good telling someone who may have never made a certain thing before (or seen it made by their mother) to "season it with salt and pepper" and not give them any idea of the amount. So I make a point of figuring out a specific amount for them. Let me know how those resting times work for you.